Sometimes I have plenty to say, but other times it is best to let the others do the talking. Every day I read something inspiring, informative, or just plain fun, and it seems selfish not to help spread the word about these great articles, videos, and podcasts. I’ve decided to try something a little different. 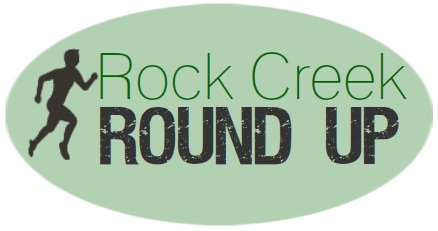 Once a month I’ll do a “round-up” of sorts, highlighting a few of the best things out there on the interwebs. If you have something you think I missed, share it in the comments section or email me and I’ll consider it for next month! 1) There are few people out there as inspiring as the 25 year old Kilian Jornet. His love for the mountains, running, and running up mountains has taken him on more than a few amazing journeys and to victories at nearly every ultramarathon he enters. The recent New York Times Magazine article, Creating the All-Terrain Human, gives us a brief look into the life of on of the world’s best mountaineers. 2) If you have trained for a few races, you know that sometimes things just don’t go as planned. Meaghan Stakelin of DC Fit Crasher recently experienced just that, and was forced to adjust her expectations leading up to the Rock n Roll USA half marathon a few weeks ago. 3) Imagine signing up for a 350 mile foot race. Now imagine that race being held in March. In Alaska. Each year dozens of people race from Anchorage to McGrath, Alaska, during the Iditarod Trail Invitational, a foot race that takes days, and an enormous amount of willpower. This year, Joe Grant took on the race for the first time and has documented the adventure on his beautifully written blog. Parts one, two, and three have been posted, and I’m on the edge of my seat waiting for the rest. 4) We’ve had lots of talk about running mantras around these parts the past few weeks. With the release of the free eBook The Power of a Running Mantra, I had a lot to share. It seems as though Fitzgerald of Strength Running also had more to share than he could fit in to his article in the ebook. In his recent post, Grimace! Running Mantras That Help You Get Tough When Races Hurt, he shares his mantra tactics and great advice on how to use them when things get the toughest. 5) For the past several months Matt Frazier of No Meat Athlete and I have been hosting a podcast we’re calling No Meat Athlete Radio. This month we discussed making the leap from runner to ultrarunner, and who better to bring on for an interview than Bryon Powell of iRunFar.com. 6) Foam Rolling may very well be my favorite running tool. Injuries be damned, I’ve got a foam roller! In Susan Lacke’s recent article in Competitor, she discusses her love for the foam, and just a heads up, it is borderline creepy. 7) If you live in the DC area and haven’t heard of the new healthy living site Thriive, you should really check it out. Last week Katie Fox-Boyd of DC Yogi posted a few great yoga poses every runner needs to practice on the regular. You can also find my recent post on running in Meridian Hill Park. 8) Have trouble carrying your keys on a run? Help out PocketBands, and you just might have your solution! 9) Check it out! 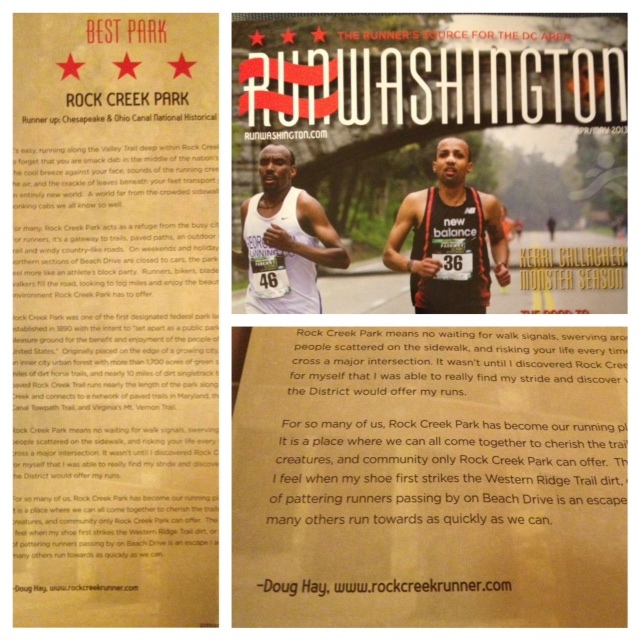 My feature on Rock Creek Park was published in the most recent edition of RunWashington Magazine. Pick up your own copy at just about any DC area gym or running store. Thanks for including me – love all the awesome links, keep em coming! Of course Meaghan! It was a great story worth sharing.